In it the district shares ongoing efforts to foster “respect for diversity and helping our students develop their global and local identities”. These efforts include Social-emotional learning (SEL), Restorative practices, Digital Citizenship and Ethnic Studies (at the high school level). I encourage families to read the post themselves and go online to share their thoughts and questions in the “Comments” section. I truly appreciate the district’s thoughtful and ongoing approach to creating welcoming and inclusive schools. As a former educator I also appreciate the district’s respect for staff in providing them with options and resources (rather than one-size-fits-all mandates.) I know this is ongoing work and look forward to learning about lessons, online resources, and professional articles the I anticipate the district is sharing within the educator and parent community. 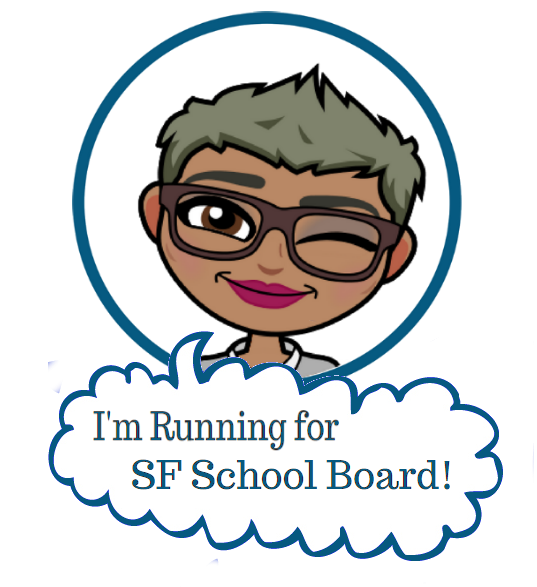 While this BIG PICTURE work goes on, I wanted to share a few questions I am hearing from SFUSD parents. These relate to how the District implements its broad plans in specific and tangible was. I encourage you all to ask these questions at site and district meetings, and add to this list. Does the District currently track reported incidents of hate speech and targeted harassment? If so, how is this data collected and shared? 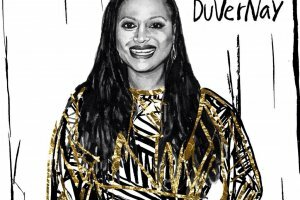 What systems are in place to ensure Black culture is visible and celebrated in ALL schools? What systemic supports are in place for Muslim, Arab and Latino students and families? For undocumented families? How are we ensuring homophobic language (“That’s gay” and “f*ggot”) and misogynistic language (b*tch, c*nt, etc.) are not tolerated in schools? I’ve shared these questions with district leadership and will definitely be posting when I get more information. 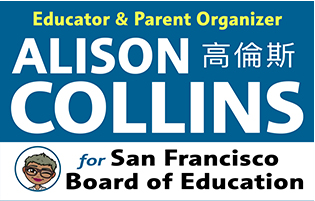 In the meantime, I wanted to share some thoughts on practical ways the district can support families and educators pushing for safe and inclusive schools. To be clear, the Student and Family Handbook is THE KEY to ensuring students feel safe and welcome in our schools. Make sure you READ and RE-READ this important document. The district has made efforts to make this more family-friendly… (much appreciated!) Nonetheless, in many cases, it’s dry reading. That’s because much of it had to be written in legalese. That is, much of it is CA State Ed Code or SFUSD Board Approved Policy. Meaning, if a school or the district isn’t doing what it’s required to do, that’s a BIG PROBLEMO, Knowing district and state policy is the first step in advocating for equity, quality and safety in our schools. I didn’t… until I read the handbook. 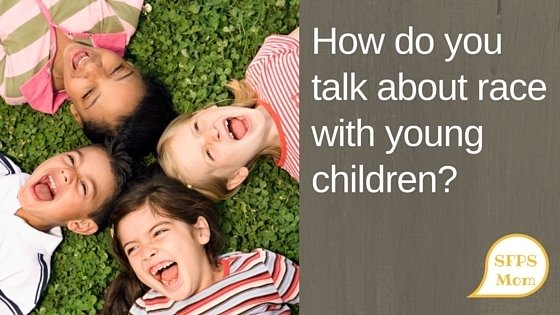 Is your school staff getting this training? Last year, when my daughters and I reported incidents of hate speech and bullying at their school, I was surprised to learn that many staff and students (and even a few Board Members) were unaware of the Safe School Line. 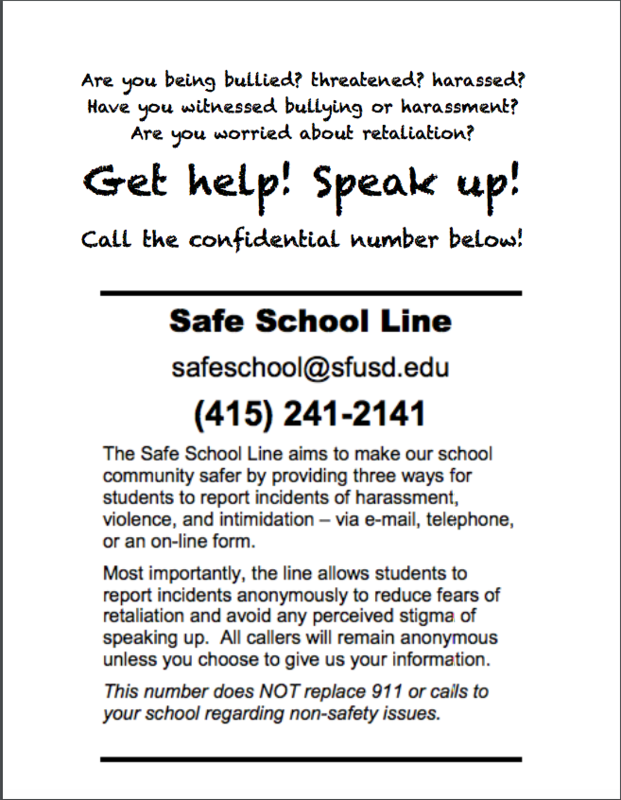 It would be really beneficial to students, families, and teachers if schools could post Safe School Line information in every hallway, bathroom and classroom. They could also make it a regular practice to share information about complaint procedures related to supporting safe and supportive schools, this includes reporting Sexual Harassment, Hate Speech, Racial Discrimination, etc. 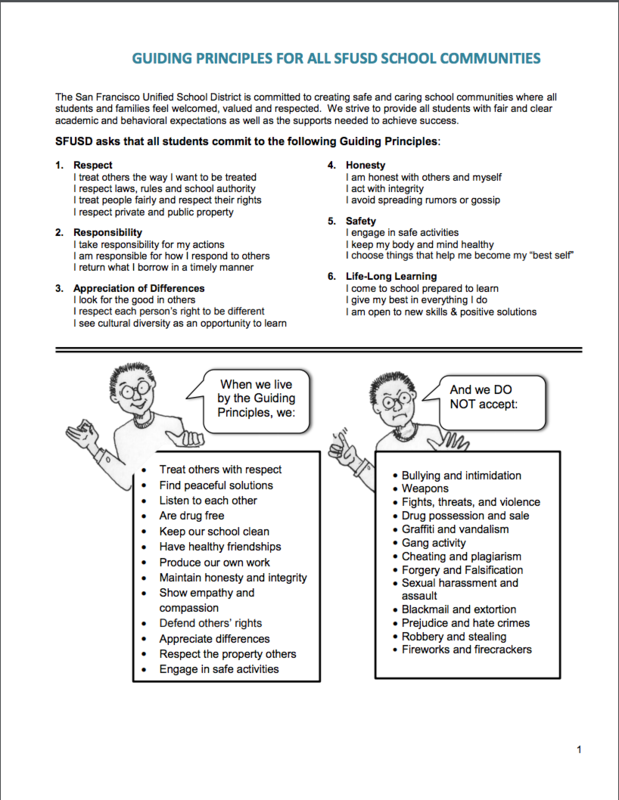 Again, the Safe School Line and Complaint Procedures are all listed in the SFUSD Student and Family Handbook). What do you think? Is the district doing enough to support safe, inclusive and bias-free schools? Do you know of resources to support this work? Share in the comments below. According to "the Academy" the only voices worth hearing are vanilla. 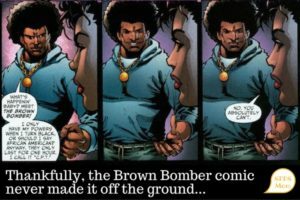 Here's what I'm doing to celebrate more diverse narratives in movies!